Kathy writes: We’re hosting a playoff football party next week. Not my idea, but I’m happy to cook. I want to make pulled chicken. I’ve done pulled pork before. Is chicken more or less the same gig? I give you creative license, Cook Angel, to guide me here. Thanks! Tony’s take: You’re right, Kathy: “pulling” generally applies to pork, but the technique can also work with beef, lamb, or chicken. There’s no clear line separating “pulling” from “shredding” or any other form of breaking up slow-cooked meat into small pieces, but all of these preparations follow a basic method: take a full-flavored cut (ie: fatty or well marbled), season it well (anything from S+P to a spice rub), and then slow-cook (either a braise or some form of roasting) until the meat becomes extremely tender; tender enough that it can be pulled or shredded. If you add some smoke during roasting, as is traditional with Southern barbecue, all the better. If you braise, the cooking needs to be at a low temperature so that it melts the meat’s marbling, collagen, and fat instead of making the cut tough (as high heat would) – check out Molly Stevens’ tome for the definitive word on all things braising. The broth should be relatively tangy to match the richness of the cut. To serve, you can pile the shredded meat into a bun Carolina BBQ-style, though with that power you’ve vested in me, I’m going to call an audible and guide you towards tacos; a little more jazzy, easier to serve yourself, better fitting with the overall mood of a party. You’ll still follow the same cooking method, only change up the flavorings and the ultimate destination. Braise the chicken in a spicy broth of smashed garlic cloves, whole chipotles, a touch of tomato paste, and beer until it becomes completely tender. 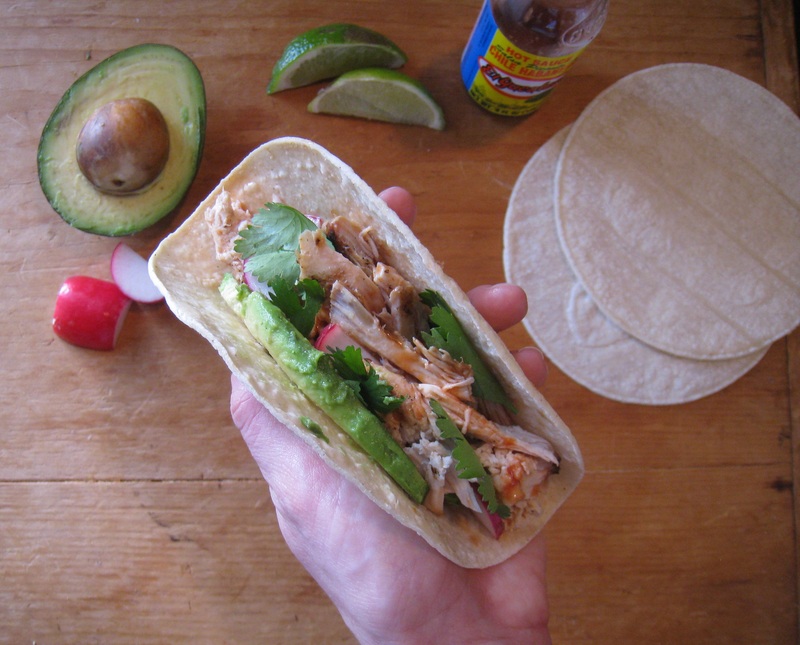 Then shred, serve on corn tortillas with your choice of toppings and huddle up for the game. That fulfills your hosting responsibilities, now it’s up to your team to do its thing. 1. Season the chicken: Use thighs here (preferably boneless). Breast meat is too lean to braise. The fatty patches in chicken thighs (which ordinarily can make them undesirable to some), cook off beautifully in this preparation: Set 2 lb. boneless chicken thighs (about 8) in a large bowl. In a small bowl, mix 2 tsp. kosher salt, 1 tsp. black pepper, 1 tsp. granulated sugar, 1 tsp. chili powder, and 1/4 tsp. chipotle powder, then sprinkle on the chicken and toss well. Hold for up to 1 day in the refrigerator for best flavor. 2. Sear: Browning=flavor so the goal in this step is to get a good, even sear. Do so over medium heat so you don’t scorch the sugar or spices in the rub. Set a large heavy-based Dutch oven or medium pot over medium heat for 2 minutes. Add 2 Tbs. olive oil and, once it’s shimmering hot, set half of the chicken in the pot, evenly spaced. Sear without touching until the chicken browns around the edges and easily releases from the pot, about 2 minutes. Flip and brown the other side, 2 minutes. Transfer to a large plate and cook the remaining chicken thighs in the same manner (and transfer them to the same plate). 3. Braise: The real trick here is to find the right braising temp on your range (or in your oven) to maintain a very gentle simmer. On my electric stovetop, it’s right around medium-low, though on a good gas range, it can be closer to low: Raise the heat to medium high, add 3 smashed garlic cloves, 2 to 3 dried chipotles, and 2 bay leaves and cook, stirring, until they sizzle steadily and become fragrant, 30 seconds. Add 3/4 cup beer (go with a light lager if you have) and cook, scraping the bottom of the pot to incorporate any caramelized browned bits until the liquid almost completely cooks off, 1 to 2 minutes. Add 1 cup chicken broth and 1 Tbs. tomato paste and bring to a boil. Reduce to a light simmer, tuck the browned chicken thighs into the broth, cover, and cook, flipping the chicken occasionally, until it becomes completely tender (it should pull apart easily) and the fatty patches cook off, about 1 hour. 4. “Pull” and serve: Fingers, tongs, or a knife would be fine, though I’m partial to a couple of small forks; they work delicately, plus they allow you to shred while the meat is still hot: Remove the braise from the oven, uncover and let sit for 5 to 10 minutes to cool a bit. Then using the tines of 2 forks, shred the chicken into thin strips. Serve on warm corn tortillas with your choice of toppings. I went with a colorful mix of avocado, thinly sliced radish, and cilantro.